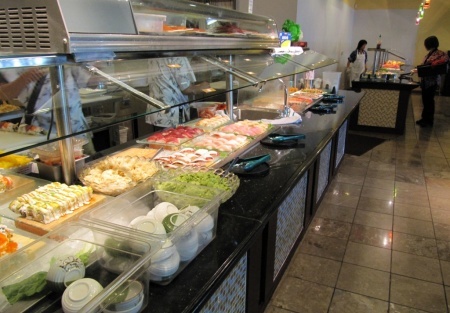 This wonderful Japanese sushi, seafood and grill restaurant is located in one of the hottest and highest growth areas in the Sacramento region. You may ask why so cheap? Are they really doing $1.2 million? Why are they selling if the store does such volume. Well, this is no trick, there are no smoke and mirros here. The owners opened a major new restaurant concept, in Daly City, where the sales are in excess of $1 million a month! They now are putting a full court press in the Bay Area to open store number 2 and 3. As a result, they are selling off their Sacramento stores at bargain prices. And this is one of them. The owners have neglected the stores because they're spending all their time at the Daly City store resulting in the Sacramento stores losing sales volume over the past 6 months. This trend can be turned around as the product is well received by the locals and the brand still have a good following. In this broker's opinion, the stores are hurting because they are absentee run resulting is poor menu choices by the all Chinese staff who seem to be stuck on only doing Chinese food where in the past they owners would mix-up the menu with American as well as Italian items; fragmented pricing structure that encourages people to cheat on their age and the prices are too cheap in my opinion; and the stores are dirty and cluttered and in need of basic clenaing throughout. This store did about $110,000 gross in January. Sale started out in the $130,000/mo. range and moved to close to $160,000/mo. before tailing off for all the reasons I mentioned above. This is not a franchise, but the owners will allow the buyer to use the name and recipes in this one location for as long as the buyer wants. Or if you want, go ahead and change the name. It's all up to you. The restaurant is beautiful and nearly new. So you won't have to stick money into it when escrow closes. This store is absentee operated. Monthly payroll is about $22,000. Food costs are about 45-50% right now as the store goes through the learning stages of reducing food costs. The rent is about $15,500 including CAM. There are 5,000 Sq. Ft. So you can do the math to get the profit number. Annual Revenues of $1.2 million are Calculated Using The Past Three Months Average and Annualizing the Amount. To learn of the name and location, please select one of the orange buttons below. This is a Paramount Restaurant Brokers, Inc. DBA SellingRestaurants.com listing. Name, recipes, and employees included. Monthly Sales range from $140,000 to $160,000 today. Annual Revenues of $1.8 million are Calculated Using The Past Three Months Average and Annualizing the Amount.